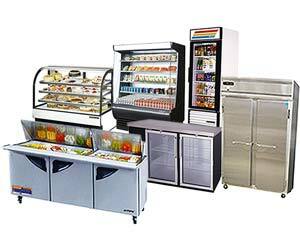 Every food service operation needs reliable refrigeration equipment. From underbar chillers, to merchandisers and reach-ins, there are almost limitless options to address all of your refrigeration needs. Whether you are storing food in the kitchen, or selling grab-n-go salads out front, the right unit will keep food fresh and delicious. Air curtains and strip doors are a cost-effective barrier between warm and cold air environments. You'll save energy by hanging a vinyl strip door inside your walk-in. It allows staff to easily walk in and out, while limiting the amount of cold air loss. Ideal for take-out windows and convenience store doorways, air curtains help maintain the interior temperature, and also help to keep out bugs. These refrigerated deli cases come in a variety of sizes to suit the needs of any business. Choose from curved or straight glass-front designs with both front and rear access, to display your finest pasties, salads, or meats. Ideal for schools and convenience stores, horizontal ice cream freezers come in black or white exterior, and a variety of widths to suit any space. Featuring 2 sliding glass doors, it is "clearly" the best way to display self-serve frozen treats. For ice cream service, a dipping cabinet is essential. Choose a hinged flip lid cabinet, or display your frozen treats for customers with a glass top dipping cabinet. Whether using ice to keep foods cold, or to make refreshing beverages, a quality commercial ice machine is a must. Choose from air cooled or water cooled units for hotter environments; and from a variety of cube sizes and shapes. Available in several capacities, so you can ensure clean, fresh ice all day long. Some units have a built-in bin, while others can be matched with a number of different size bins. Making pizza can be fast and easy with the right prep table. Available in widths from 43 - 120 inches, each unit is equipped with a cutting board and food pans to keep sauces and toppings organized and accessible. Bases come with either doors or drawers or a combination of the two. Choose the right set up to fit your kitchen's unique needs. Reach-in refrigerators and freezers are the most versatile cold storage units in any commercial kitchen because they are available in such a vast array of sizes and styles. Choose from a 1, 2, or 3 door unit, with either glass or solid doors. You might also opt for a pass-through or roll-in unit. Compressors can be top or bottom mounted. And some units combine refrigeration and freezer compartments in one. With this many choices, it's easy to get just what you need. From a single-cabinet, compact prep table to a 72 inch table for a busy sandwich shop with a daily lunch rush, sandwich/salad prep tables offer a vast array of features to ensure you can select the most efficient unit for your kitchen. Available with either doors, drawers or a combination, these prep tables feature attached cutting boards, removable hoods, and plenty of food pan holders. Keep beverages frosty cold with commercial bar refrigeration equipment. Whether you need a horizontal bottle cooler or a glass door back bar cooler, we've got a way to keep your bottles and cans cold. For a frosty brew on tap, a beer dispenser is just the thing. Undercounter and worktop refrigeration units come in a wide range of sizes and configurations to accommodate everything from a cramped food truck, to the largest hotel kitchen. Designed to fit under standard countertops, the undercounter units are an economical, space-saving way to keep cold items close at hand. The worktop units create a compact work station with refrigerated ingredients just below. Many units are equipped with casters for easy mobility. Walk-in refrigerators and freezers can be fully customized to fit in any space, and to accommodate any contents. Large enough to accommodate multiple shelving unites, these insulated boxes are available with a durable aluminum floor for safe storage. Boxes come with or without the refrigeration/freezer units attached.